On Saturday, July 3, our bishop celebrated Eucharist with the Pacto Divino Community on Sixth Street in downtown Los Angeles. 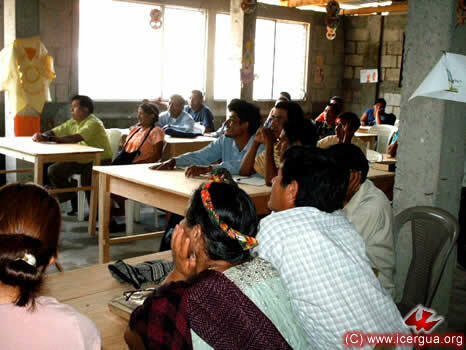 This community, composed for the most part of ethnic Kiché Guatemalans, has managed to stay on an even keel over the years, in spite of the difficulties it has had to face. According to their report, they are now in a re-organizational phase in order that the community may conform more completely to the characteristics and identity of our Church and fulfill the mission that the Lord has entrusted to us. 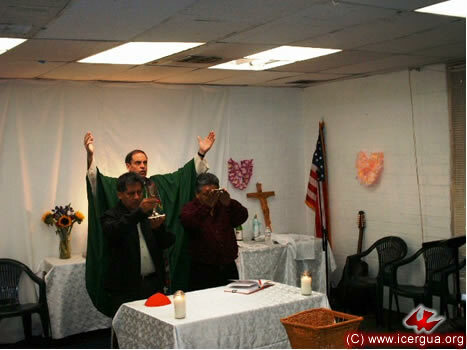 At 3:00 on the afternoon of the same day, Monsignor Eduardo celebrated Eucharist at the El Pescador ministry, which is also where the Renewed Catholic Parish of San Miguel Arcángel is located in Los Angeles. Every day the community is growing and becoming stronger in its spiritual depth and missionary identity. Sunday, July 4, began with a celebration of the Eucharist for the students of ESTYMLA-Los Angeles. At left: brothers Matías and León, both of whom are Communion Ministers, during the Mass. On July 5, our bishop arrived in Rio de Janeiro, having been invited to participate in the celebration of the sixty-fifth anniversary of ICAB (Catholic Apostolic Church of Brazil), through whom the Lord has given us the gift of Apostolic succession. 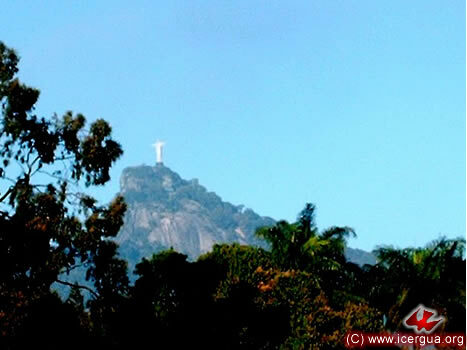 The guests were housed in a monastery near where the Christ of Corcovado is located, as can be seen in the photograph at left. The high point of the celebration was the celebration of the Eucharist with the participation of ICAB’s thirty-seven bishops, four bishops coming from the two provinces of CICAM (Worldwide Communion of Catholic Apostolic Churches) in Argentina, numerous presbyters and some parishioners. As President of CICAM, our bishop was invited to give the homily during the Eucharist. At right: a moment during the homily. It focused on the question of the identity of the whole Catholic Apostolic Church, having at the beginning emphasized the importance that what justifies our existence and mission is the serious and unconditional commitment to rediscover the roots of the church in the Holy Scriptures and tradition and to accept and implement them in the way the church is organized and in the way it conducts missionary and ministerial activity. JULY 7. MEETING OF THE BOARD OF DIRECTORS OF CICAM IN RIO DE JANEIRO, BRAZIL. 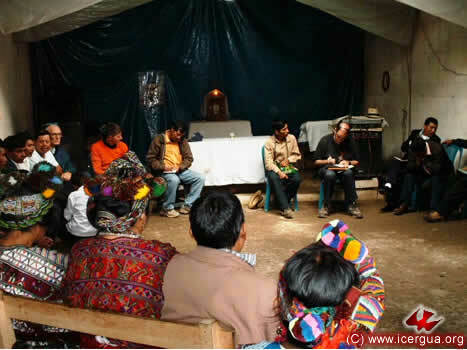 On July 7, the Board of Directors of CICAM had a short meeting, and our bishop took advantage of the session to ask to be excused from exercising the role of President and Executive Secretary because of the heavy commitments he has in ICERGUA. The responsibilities attendant upon the role as President will be taken on by the Vice President and those of Executive Secretary by Josivaldo Pereira. This leave will last until the next meeting of the Board, which will take place next year along with the ICAB Council, during which new elections of the Board of Directors will take place. JULY 9. VISIT TO THE COMMUNITY OF CHUITZANCHAJ, SANTA CRUZ LA LAGUNA, SOLOLÁ. 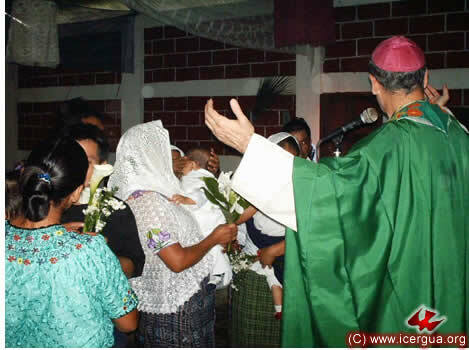 On July 9, our bishop made a visit to the Community of Chuitzanchaj, Santa Cruz La Laguna, Sololá. This community, now as in the past, is working with great dynamism and enthusiasm, and on every visit the bishop learns that a new family has joined the community. Above: The Absolution of sins, after the Confession. JULY 10. 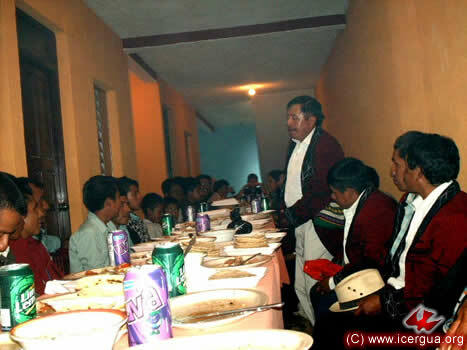 CELEBRATION IN CHOCHAL, CHIANTLA, HUEHUETENANGO. On the occasion of the bishop’s visit, the Community prepared the celebration of many First Communions. Right: some of the children have received communion and are giving thanks for the gift received. JULY 10. 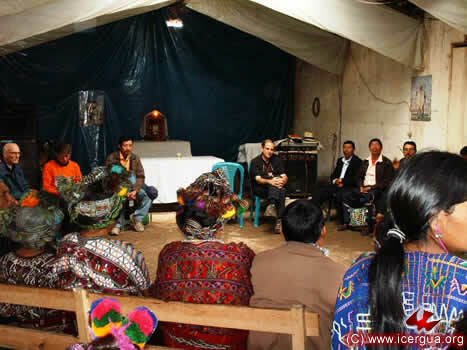 EUCHARIST WITH THE FAITHFUL IN CHINACÁ, HUEHUETENANGO. 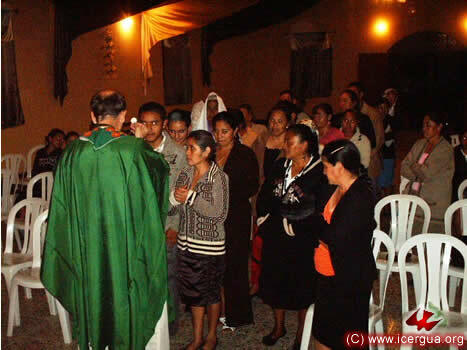 In the evening of the tenth, Monsignor Eduardo visited the Chinacá Community in Huehuetenango. The reason for the visit was to give God thanks for all the blessings received. The community continues to be excited and is trying to respond faithfully to the Lord’s call. 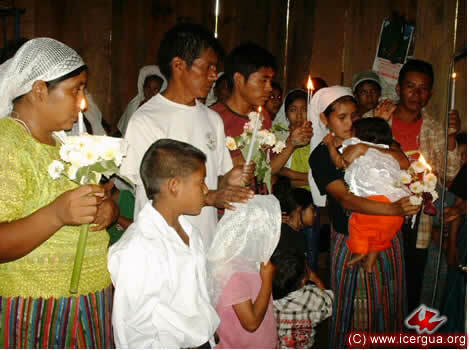 Above: Among the faithful who are receiving Absolution are Carlos and Flori Muj Juracán, the couple who, along with their two sons, are responsible for maintaining ICERGUA’s Education Center in Huehuetenango. Right: a moment during the distribution of the Holy Communion. JULY 11. VISIT TO THE CAPELLANÍA COMMUNITY, CHIANTLA, HUEHUETENANGO. On Sunday morning, July 11, our bishop presided at the Eucharist in the La Capellanía Community, located in the heights of the Cuchumatanes, in the municipality of Chiantla. This community has grown vigorously in recent years. 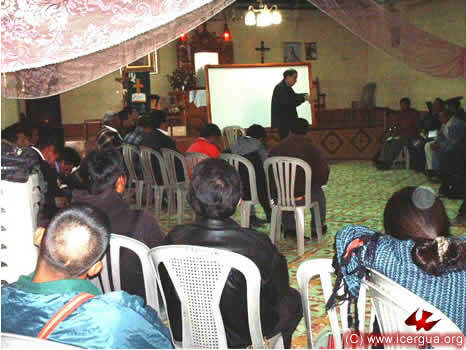 Two or three years ago, when they constructed their new church building, they thought it would be large enough to house all the faithful of all the Chinatla communities when they come together. Now, by God’s blessing, they fill the building just by themselves, as happened this Sunday, for they have been blessed with so many new members. Above: Prayer and repentance during the confession of sins. Right: One of the Ministers of Communion helping the distribution of communion to the People of God. Left: After the Eucharist, the faithful who make up the Pastoral Council asked to have a meeting with Monsignor Eduardo. The topic was to request that they might be established as a Renewed Catholic Parish and to ask what steps have to be taken in order to attain this outcome. At the end of a long dialogue, the conclusion was that they did indeed want to be made a Parish, that they would fulfill all the established requirements, and that their formal request would be presented to the 21 August Assembly. JULY 11. 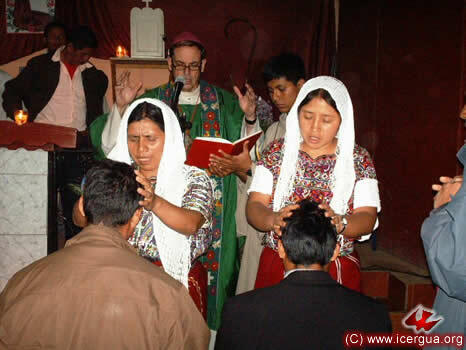 DEACONAL ORDINATION OF SUB-DEACON PEDRO MARTÍNEZ IN CUILCO, HUEHUETENANGO. 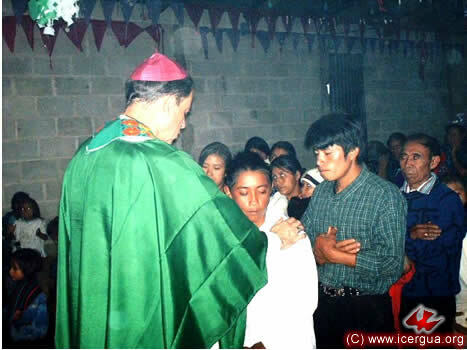 On the afternoon of July 11, the bishop went to the Central Cuilco Community. 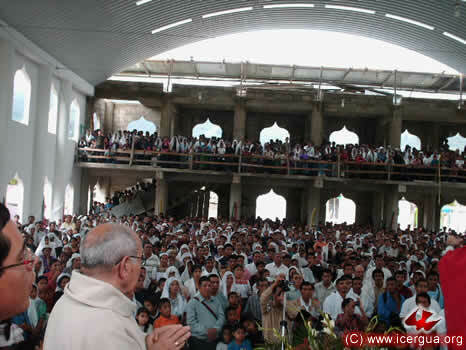 More than two thousand brothers and sisters from the town and the surrounding villages had met in the church in order to participate in the deaconal ordination of Pedro Martínez. 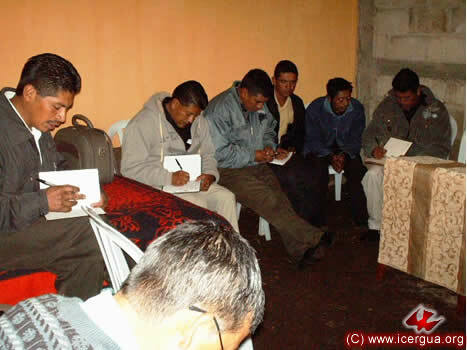 Pedro, originally from El Salvador, has studied for several years at the Seminary and at present is doing his EPS (supervised pastoral field work) in Cuilco. The ceremony was very beautiful and moving. As could be instantly and continuously felt, the atmosphere was charged with the joy of the People of God and the hope that soon they will have their own presbyter living at the church and that they will be established as a Parish. Above: Invoking the Holy spirit at the beginning of the Eucharistic celebration. 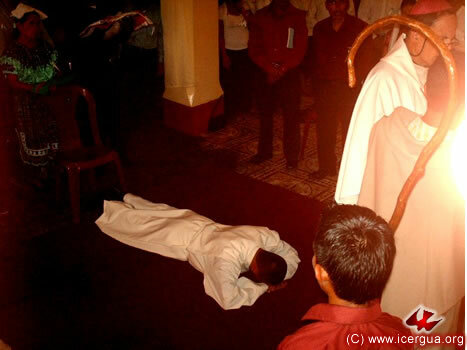 Right: The candidate for deaconate lying prostrate as a sign of complete submission to God, during the singing of the Litany of the Saints. Left: The bishop delivering the Gospels to the newly ordained deacon, emphasizing that his ministry must include the proclamation of the Gospel in its wholeness, first of all through his life, words and conduct, but also through his entire ministry. Right: A partial view of those attending the celebration, coming forward to congratulate the deacon during the Exchange of Peace. Among them is Dr. David Greene, a friend of our Church and a big help; in addition to giving English classes to the Seminarians, he is the person who translates all the news and documents of ICERGUA into English. JULY 13. MEETING OF THE PRESBYTERY IN LA ANTIGUA GUATEMALA. 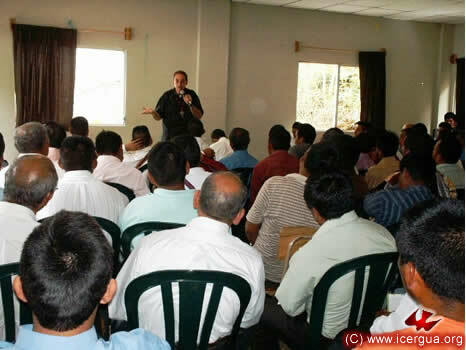 On Tuesday, July 13, the Presbytery of ICERGUA met. Everyone present gave a report on his pastoral work. In general the evaluation was very positive, for in every community and parish growth and consolidation of the distinctive aspects of our identity are clearly to be seen. As the theme for instruction and formation, the bishop chose the question of the historical development of the church and of the commitment that we have to continue working to deepen our ecumenical communion. JULY 16. DEANERY OF NORTH QUICHÉ 2 IN ILOM, CHAJUL, EL QUICHÉ . On Friday, July 16, began the bishop’s quarterly round of meetings with each of the deaneries that make up our Church. As frequently happens, the first one was the Deanery of North Quiché 2, which is comprised of the communities of Chajul, El Quiché. 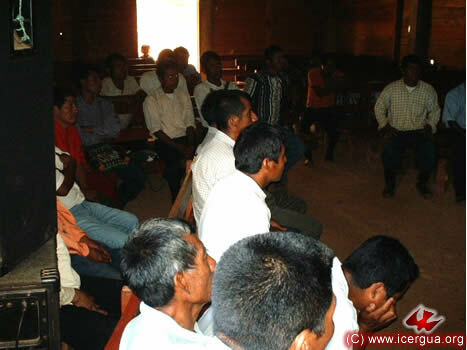 This time the meeting was in the Ilom Community. Representatives of all the communities were present. Each of the delegates gave a short report on the pastoral work in their communities. Their overall happiness and commitment could be felt, and they testified that the communities are all growing and there even are new ones springing up. 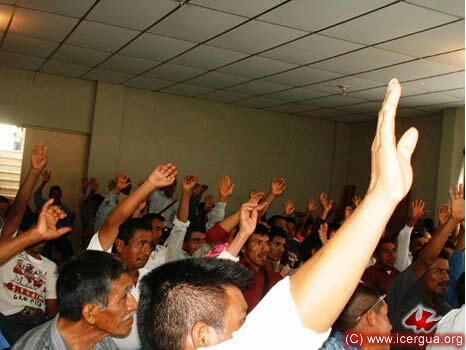 Above: The faithful giving their reports on their communities to the meeting. Right: The bishop commending the reports and giving his customary instruction. This time it zeroed in on the historical development of the church and on the commitment that we have to work toward the ecclesiastical unity with those who have maintained faith in its entirety in the one, holy, Catholic and Apostolic church. JULY 16. 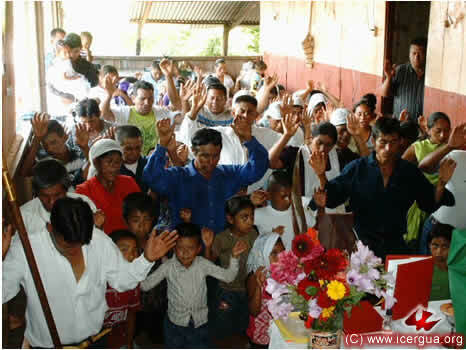 EUCHARIST IN THE LAS PILAS COMMUNITY, NEBAJ, QUICHÉ. 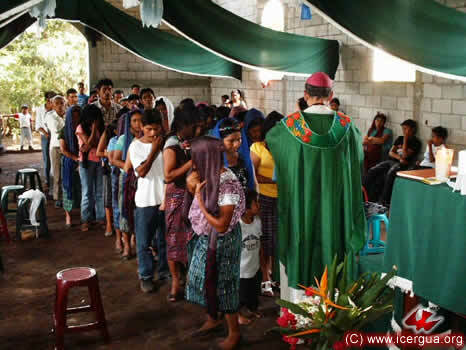 In the afternoon, the bishop made his first visit to the Las Pilas Community. 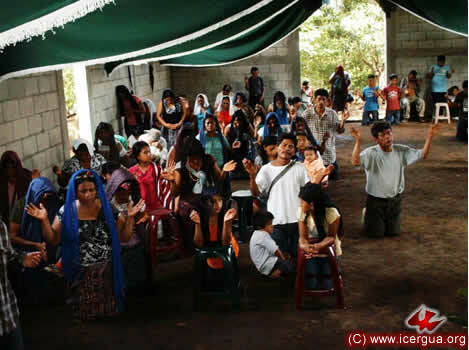 This community, which belongs to the municipality of Nebaj, is at a time of special joy: having lost the church building that they had constructed, they have now succeeded in buying a new lot, have made temporary quarters, and have procured most of the material needed for a cinder block building. The community is growing powerfully, and feeling deep gladness and hope. Above: The bishop praying over some of the faithful who are receiving Christian Initiation. Right: After the bishop ended the rite of chrism, the parents and sponsors of those who received the chrism come forward to pray for their perseverance in the faith. Left: During the celebration there were also marriages. Here, one of those contracting marriage giving a ring to his wife as a sign of his everlasting love and fidelity. JULY 16. 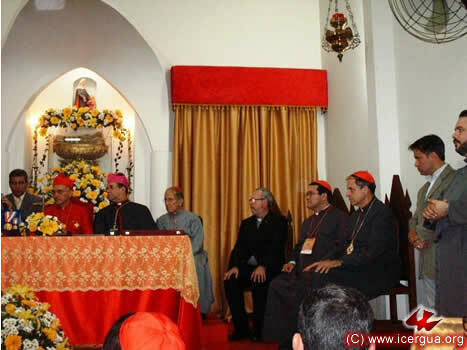 MASS IN EL CHEL, QUICHÉ. In the late afternoon, the trip to Chel began. From the road that leads to Chel one can see the huge hydroelectric facility of Xacbal, whose construction is practically complete and ready to be put into service. 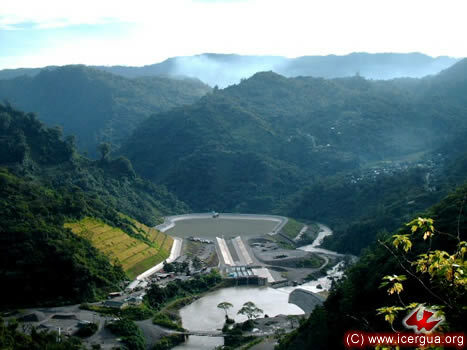 This work has stimulated community development and has already increased prosperity in the whole region. The road that before had only a single lane is now a two-lane highway in excellent condition in spite of the heavy rains. Communities that had been completely isolated have begun various projects that confirm their self-esteem. The various forms of support that they have received give them glimpses of a more prosperous future. Eucharist was celebrated in the Chel Community during the evening. 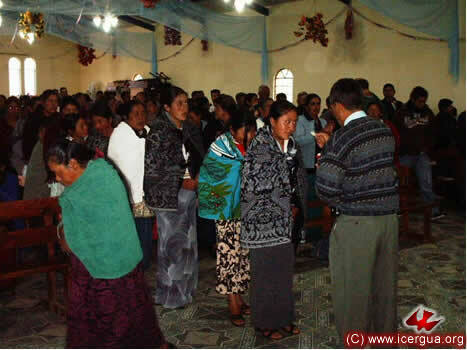 The faithful of Chel are always full of enthusiasm and apostolic zeal. At present they are involved in organizing two new Renewed Catholic communities. Above: Prayer during the confession of sins. Left: The People of God coming forward to receive the Absolution of sins. JULY 17: DEANERY OF NORTH QUICHÉ 1 IN NEBAJ, QUICHÉ. On Saturday, the seventeenth, the meeting of the North Quiché 1 Deanery took place in the house of prayer of the Tu Manzano Community in the downtown Nebaj. It was a very fruitful meeting, attended by representatives of all the Renewed Catholic Communities in the Deanery. The theme was the same as that which the bishop had dealt with at the Presbytery meeting and now with each of the deaneries. Specifically, the topic is that of deepening awareness of the historical process of forming the church from the time of the Apostles to the time when the ecumenical union was broken by Rome and the great schism began. Afterwards, the brothers and sisters listened to one another’s comments on the possibility of deepening our ecumenical dialogue. Above: One of the representatives reporting on what has taken place in his community during the past three months. Left: At the end of the formative instruction, the programs and pastoral calendars for the next three months were distributed. The faithful participated actively, happy in and responsible for all the processes that they are carrying forward. 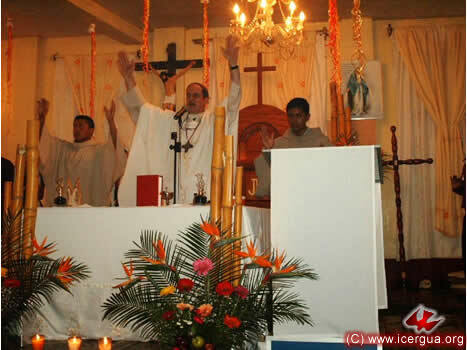 JULY 17: DEACONAL ORDINATION OF SUB-DEACON MARCO TULIO CALDERÓN IN NABAJ, QUICHÉ. 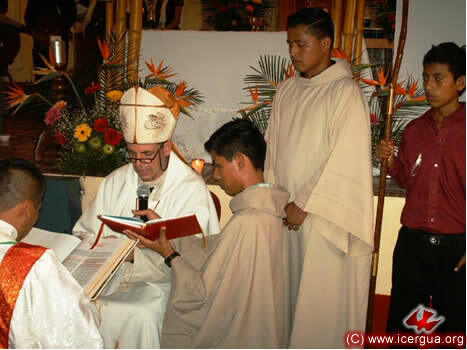 On the afternoon of the seventeenth, the deaconal ordination of Marco Tulio Calderon Mira took place. 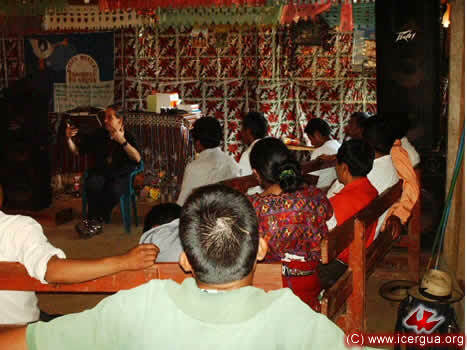 Marco Tulio is doing his EPS with the communities of Nebaj and Chajul. 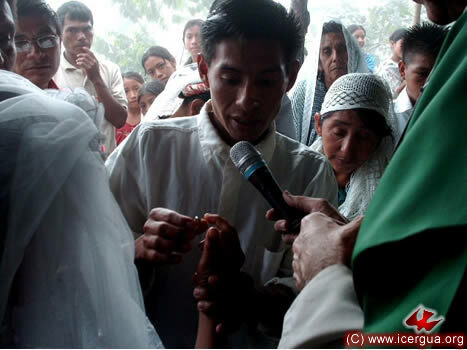 The ordination took place at the Nebaj Channel 15 television station. Many delegates came from every one of the communities that are served in these areas. Above: The central moment of the ordination—the laying on of hands. 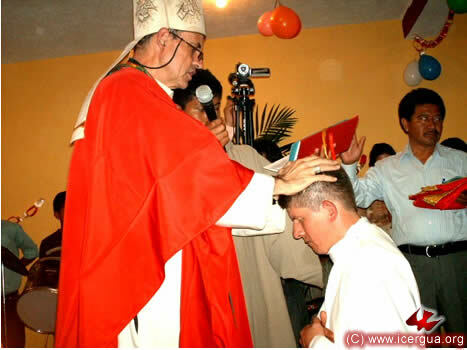 Here Monsignor Eduardo is putting his hands on Marco Tulio’s head, imploring the outpouring of the Holy Spirit that he may be consecrated a deacon. Right: The people of God pray, asking the outpouring of the Holy Spirit. Left: The bishop delivering the Gospels to Marco Tulio, reminding him of some of the essential aspects of his deaconal ministry. 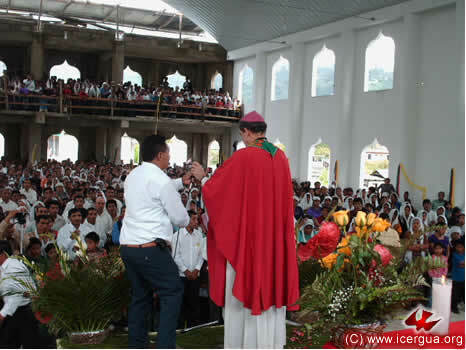 Right: At the end of the ceremony, as a sign of their gratitude and solidarity as well as their acceptance of Marco Tulio as a brother, the leaders of the community gave him the hat that is distinctive to the locale. In this photograph one sees the bishop at the close of the ceremony with the new deacon, Marco Tulio, wearing his new hat, and the seminarian Arturo. Left: The celebration ended with a splendid banquet that the Councils of the Communities put on. In the photograph: one of the leaders making the offering. JULY 18. 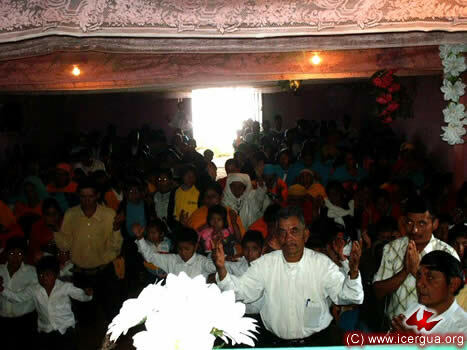 CELEBRATION WITH THE COMMUNITIES OF XEPIÚ, SALQUIL GRANDE AND SALQUILITO, NEBAJ. 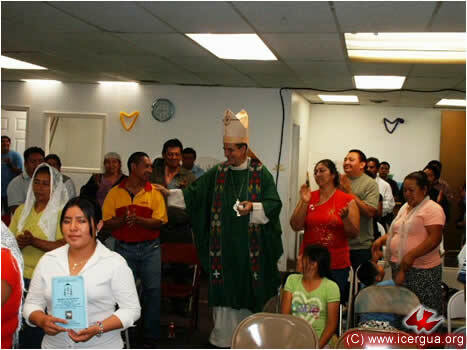 The bishop began July 18 by a morning celebration of the Eucharist with the Community of Xepiú, Nebaj. 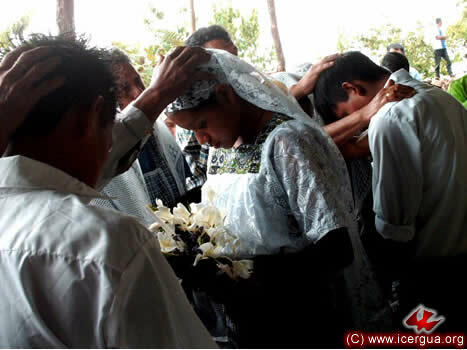 On the occasion, several children were baptized and two marriages were celebrated. Left: The baptism of one of the babies. Toward the end of the morning, the bishop visited the Renewed Catholic Community of Salquil Grande. 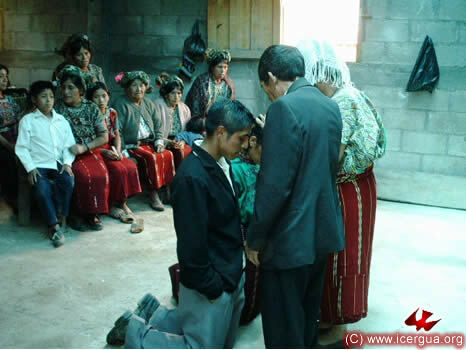 Three young people received complete Christian Initiation. They are sons in a family all of whose members have joined the church. Above: The bishop imparting Absolution to those who have confessed their sins. Left: The bishop having completed the sacraments of initiation, the sponsors come to pray over those who have just received baptism and chrism. During the afternoon of July 18, the bishop celebrated Eucharist with the Salquilito Community, located in one of the neighborhoods of central Nebaj. This community is experiencing rapid growth. Thirteen new families have joined the church just in the past three months. Many of the brothers and sisters are receiving an abundance of special gifts. Two of them have been recognized by the community as “missionaries and evangelists.” Accordingly, they are carrying out these ministries with the blessing of the community. 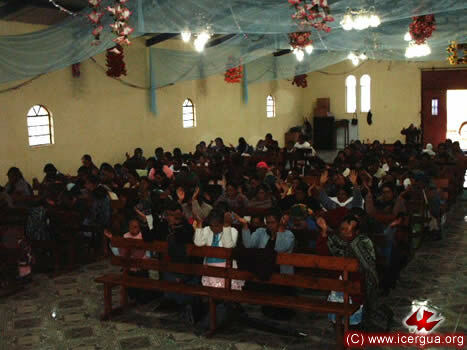 Left: After the bishop’s prayer installing them in their ministry, several of the faithful came forward to pray over them that they might persevere in the ministry entrusted to them. JULY 21. 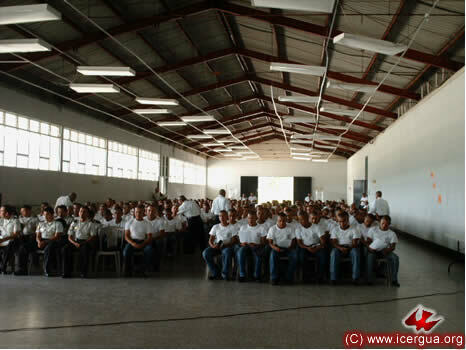 CLOSING EUCHARIST AT THE POLICE ACADEMY, SAN JUAN SACATEPÉQUEZ. 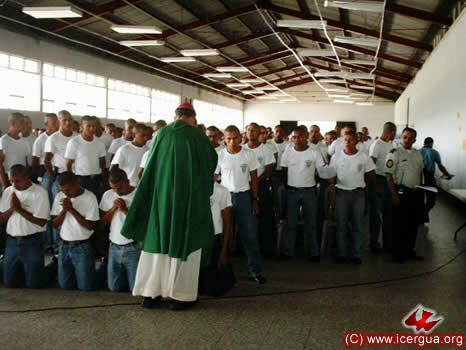 Monsignor Eduardo was invited to celebrate Eucharist on July 21 with the young people who are completing their training at the San Juan Sacatepéquez Police Academy. They wanted on that occasion to give thanks to God for the months of education that they had received and to ask the Lord’s blessing. Soon they will leave the Academy and begin to work in various places, helping to guarantee civilian safety. One of the special moments during the celebration was the administration of the Absolution after the confession of sins. The great majority of the young people came forward and with profound devotion knelt to receive the Absolution as well as to give thanks to God for the forgiveness of their sins. JULY 23. DEANERY OF WEST HUEHUETENANGO 1, AT JACALTENANGO, HUEHUETENANGO. 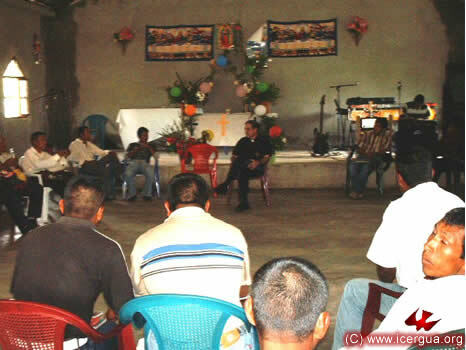 On July 23 the Monsignor held the Deanery meeting with the faithful of Jacaltenango and Concepción Huista. Representatives of all the Communities attended, and all were enthusiastic about the incredible growth that the church is experiencing. In fact many new communities have arisen and those already in existence have been consolidated. Truly a profound presence of the Lord and great blessings are being experienced. Above: The faithful listening very attentively to the reports that the representatives of the various communities are presenting. Left: Monsignor Eduardo during the Continuing Education segment of the meeting. The Deanery lasted more than three hours. JULY 23. 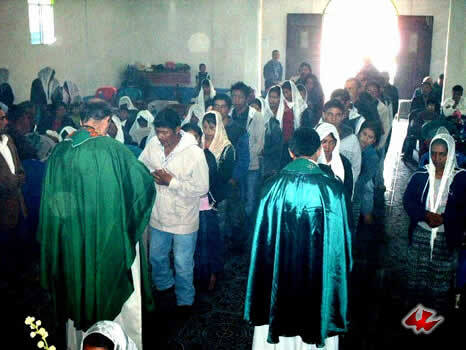 EUCHARIST IN CONCEPCIÓN HUISTA, HUEHUETENANGO. 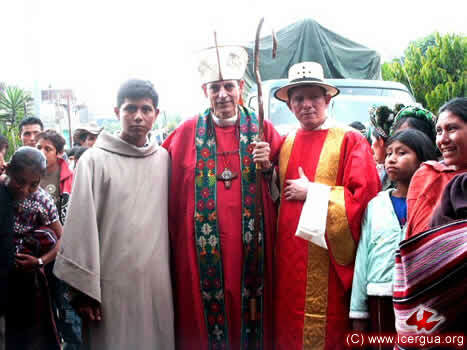 On the afternoon of July 23, the bishop visited for the first time one of the two Renewed Catholic communities in the center of Concepción Huista. During the visit, baptisms and marriages were celebrated. The community was very happy that the bishop came. Father Santos Acosta Sol is serving this area with great generosity and devotion. Above: Father Santos and the bishop administering Absolution to the faithful who have confessed their sins. Right: The new wife putting on her husband’s finger the ring that symbolizes her eternal love and faithfulness. JULY 23. 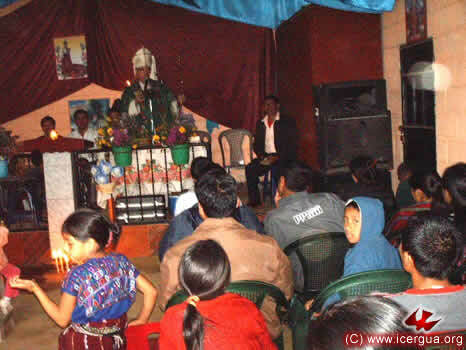 MASS IN CENTRAL JACALTENANGO, HUEHUETENANGO. 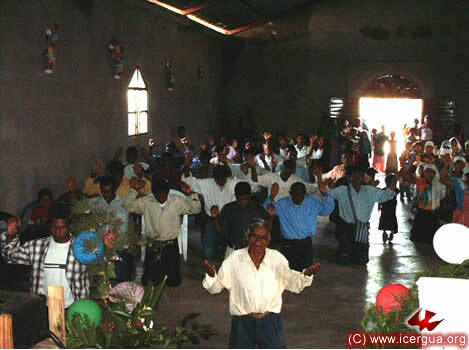 In the evening Eucharist was celebrated with the Jacaltenango Community. Until a short time ago, this community was small and had difficulties related to internal conflicts. Now it is experiencing considerable growth. The house of prayer was filled to overflowing and the atmosphere was one of joy and deep spirituality. Above: Some of the young people to whom the bishop administered Confirmation. Right: The bishop distributing communion to the faithful. JULY 24. 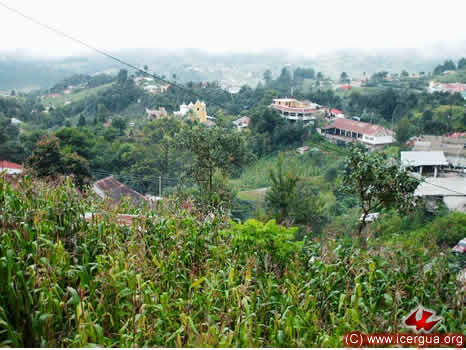 DEANERY OF WEST HUEHUETENANGO 2 IN GUAXACANÁ, NENTÓN, HUEHUETENANGO. 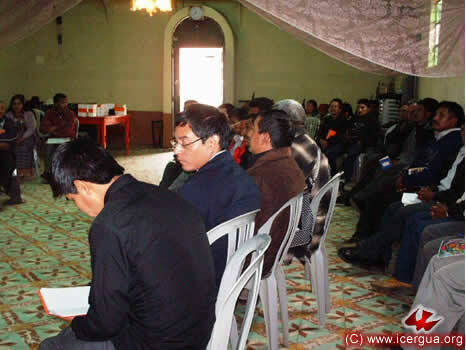 In the community of Guaxacaná, Nentón, on July 24, the Deanery of this municipality met with representatives from all its communities. About fifty faithful attended. There was an opportunity for each community to share its current situation with the others. It is to be noted that after some difficult and divisive times, it is now experiencing a time of grace, growth and expansion. For about two months now, Brother Julián Bal, the church’s chancellor, has had the responsibility of going with the leaders of the various communities and giving them training in pastoral work. JULY 24. 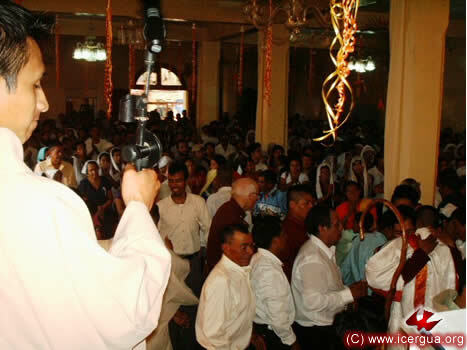 EUCHARIST IN LA TRINIDAD AND GUAXACANÁ, NENTÓN, HUEHUETENANGO. During the afternoon the bishop visited the new Renewed Catholic Community of La Trinidad, very near to the Mexican border at Gracias a Dios. 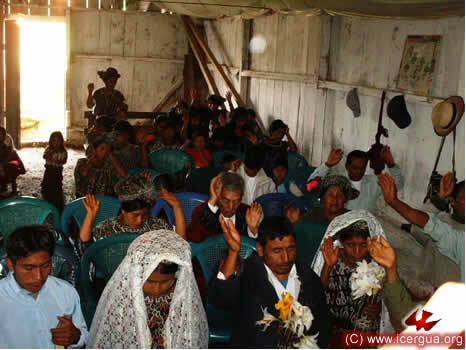 Several baptisms and two marriages were celebrated. Above: The faithful at prayer, confessing their sins. 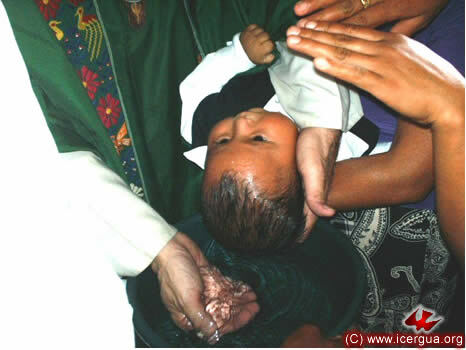 Right: The rite of baptism for one of the babies. The parents and sponsors participated actively, asking for the outpouring of the Holy Spirit on their child. 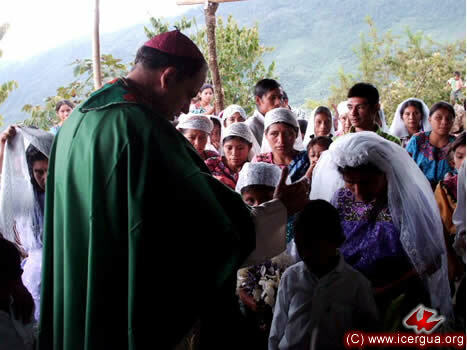 At 5:00 pm on the same day, the bishop returned to Guaxacaná to celebrate Eucharist, during which six couples were married and baptisms were celebrated. After a period of difficulties, this community has entered a growth phase with enthusiasm and missionary zeal. 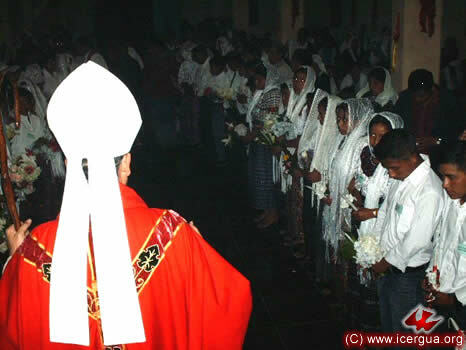 JULY 25: EUCHARISTS IN THE COMMUNITIES OF SUBAJASÚ AND CHANQUIJELBÉ, NENTÓN, HUEHUETENANGO. 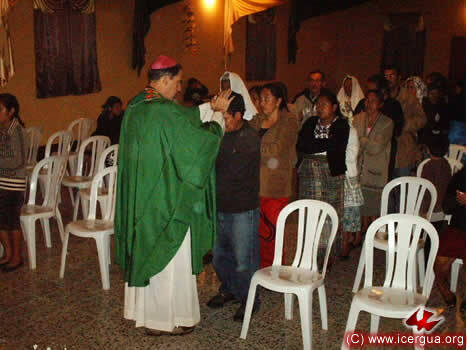 On Sunday the twenty-fifth, the bishop made his first visit to the Subajasú Community in Nentón. 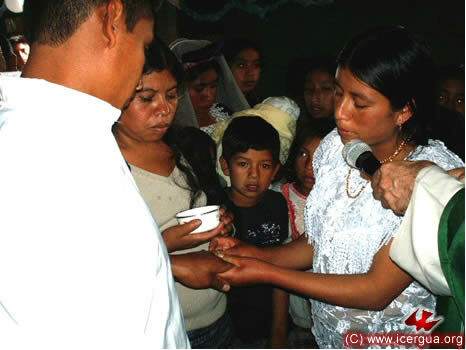 A large group of children made their First Communion and several children received baptism. The community, which has just joined ICERGUA, is enthusiastic and ready to identify itself completely with the identity and charisma of ICERGUA. Above: Praying, just before receiving Absolution. Right: Prayer after the administration of Baptism. 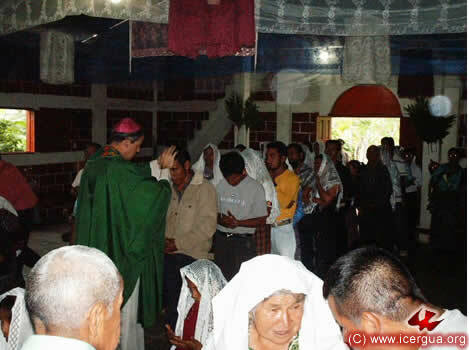 Towards midday the bishop visited the Chanquijelbé Community, also in the municipality of Nentón. This community has a beautiful church and, after a long time, has finally entered a growth phase. Now they are evangelizing and bringing the presence of the Kingdom to their brothers and sisters. Above: The bishop administering Absolution to those who have confessed their sins and are prepared to receive the sacrament of Reconciliation. JULY 25. 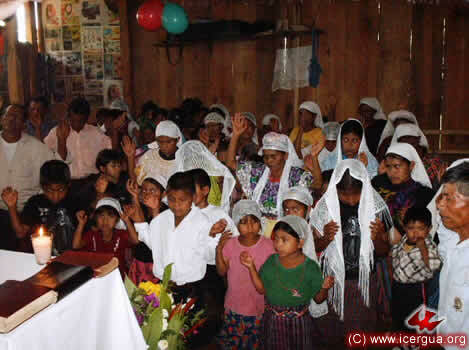 CELEBRATION WITH THE FAITHFUL IN PEPILPÁN, JACALTENANGO, HUEHUETENANGO. 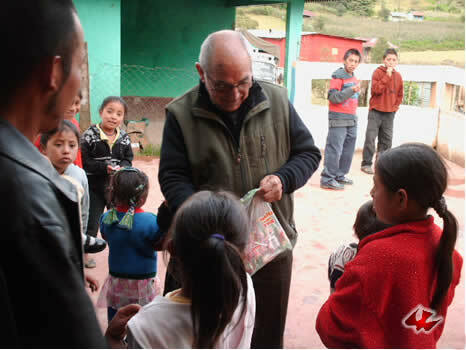 During the afternoon, Monsignor Eduardo made a visit to the Pepilpán community in the municipality of Jacaltenango. This community has had some difficulties in the past months, but at present has succeeded in becoming stable and has begun a stage of growth. In the directors’ opinion, the visit of the bishop gave them the opportunity to reaffirm their commitment to evangelism and building new communities. Above: The People of God in prayer and preparation for the Eucharist. Right: The faithful drawing near to receive Absolution, having confessed their sins. JULY 26: ARRIVAL OF BROTHER DÁMASO MATEO TO JOIN OUR COMMUNITY. On July 26, Brother Dámaso Mateo arrived in Guatemala. A Spaniard, seventy years old, he had a professional career for many years, and was also deeply involved in several pastoral initiatives both in Spain and in Peru, and now has come to join our church. His goal: to complete his education, which he has pursued at various times and places over the years, and receive holy orders. Right away, on the weekend of his arrival, he accompanied our bishop on his apostolic travels. 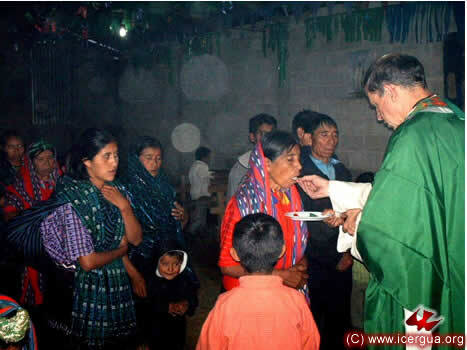 In the photograph at left: passing out candies to children in Cololaj, San Rafael La Independencia, Huehuetenango, after the Eucharist. JULY 30. DEANERY OF CENTRAL HUEHUETENANGO IN SANTA EULALIA, HUEHUETENANGO. 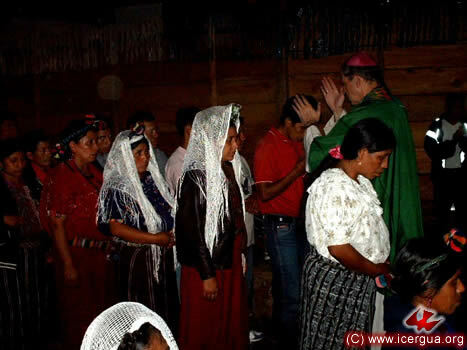 On July 30 the Central Huehuetenango Deanery met. 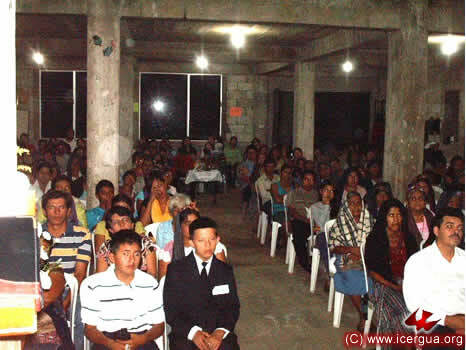 In attendance were delegates from the Parishes of San José Quixabaj, Santos Arcángeles (San Miguel Acatán, San Rafael La Independencia y San Sebastián Coatán), Santa Eulalia and San Pedro Soloma. After reporting on the life of the communities, the presbyters who are working in the deanery—Fathers Fredi Mux and Luís Felipe Corimanya—also presented a review of the work they are doing. The conclusion was a joyous affirmation of the communities’ growth as well as happiness in the birth of new communities. Above: The bishop during the Continuing Education segment of the deanery. Right: Fathers Luís Felipe Corimanya and Fredi Mux, participating along with the other faithful at the meeting. It was held in the church of San Miguelito, in the upper part of Santa Eulalia. Desde la Iglesia de San Miguelito, se tomó la foto de la izquierda, en la que se puede observar, en el área que ocupa el primer árbol de la derecha, el área en la que será construida una parroquia central para la cabecera municipal de Santa Eulalia. Los hermanos han comprado dos mil dos cientos metros cuadrados para poder realizar la construcción. JULY 30. EUCHARIST IN SAN RAFAEL LA INDEPENDENCIA, HUEHUETENANGO. 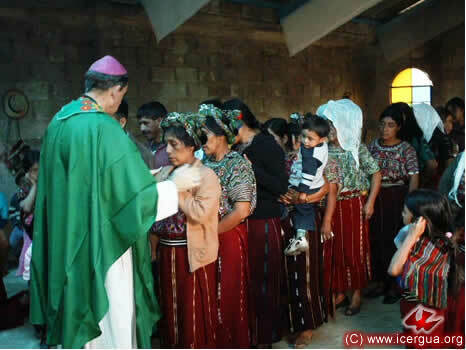 In the afternoon the bishop presided at the Eucharist celebration in the Cololaj Community, San Rafael La Independencia. Father Luís Felipe Corimanya, responsible for the pastoral work in this area, concelebrated. At the end of the Mass, the community directors asked the bishop to bless the beautiful monstrance for the Most Holy Sacrament, which was given by the faithful of the community who live in the United States. 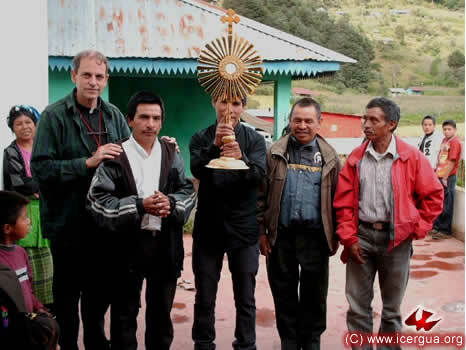 In the photograph at right, Father Luís Felipe is holding the monstrance; with him and the bishop are some of the community coordinators. JULY 31. DEANERY OF NORTH HUEHUETENANGO IN SANTA CRUZ BARILLAS, HUEHUETENANGO. 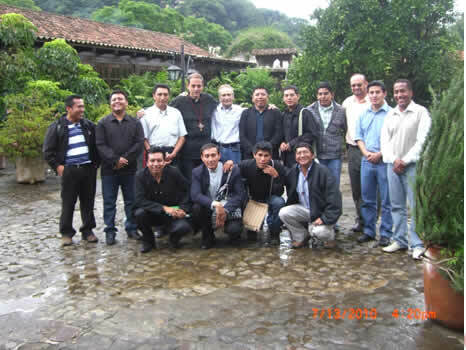 On July 31, the Deanery of North Huehuetenango met in Barillas with representatives from Barillas and San Mateo Ixtatá. About eighty faithful participated in the meeting, representing the almost ninety communities that comprise the church in this area. Their interest during these meetings is evident, as is the great benefit that they receive from them. Their awareness of our identity and mission and of the important need continually to renew our commitment to evangelism is progressively becoming deeper. One of the procedures that we have used in all the deanery meetings is to decide important matters by taking a vote. At right: the participants at the deanery voting in favor of one of the proposals that had been made. The judgment of each deanery, if it concerns matters only of that jurisdiction, takes effect after being approved by the Assembly and confirmed by the bishop. On questions that concern the whole church, it falls to the bishop to make each of the deaneries aware of the decision so that they may make corresponding decisions. JULY 31. 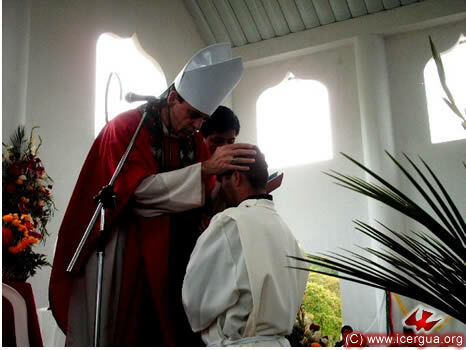 DEACONAL ORDINATION OF SUB-DEACON JOSÉ ARMANDO HERNÁNDEZ IN SANTA CRUZ BARILLAS. On Saturday, the thirty-first, the bishop presided at the Eucharist in the most beautiful church in Santa Cruz Barillas, whose construction is being completed. The space for celebrations has 820 square meters, and in view of the fact that for special occasions worshipers generally remain standing, it can hold more than three thousand participants. 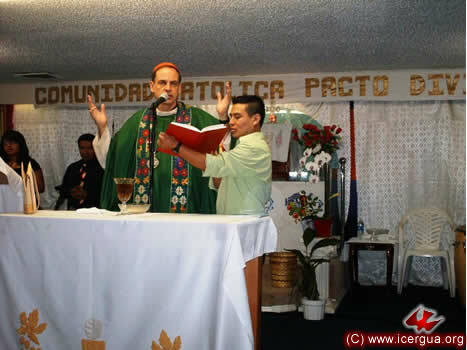 This day two events took place of overarching importance: the creation of the parish and the deaconal ordination of sub-deacon José Armando Hernández. 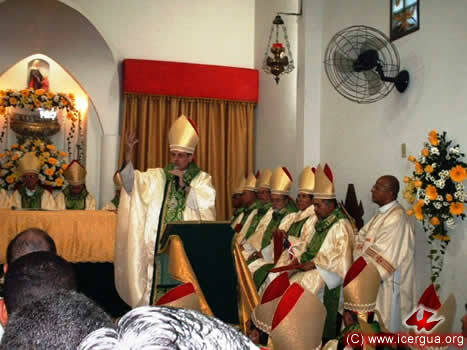 Above: Our bishop reading the decree creating the Renewed Catholic Parish of “La Glorificación de Santa María.” To the left of the bishop is brother Miguel, president of the Pastoral Council of the Parish. Right: The multitude that attended the celebration, about four thousand people. The parish has a total of 45,000 parishioners, divided into seventy communities. 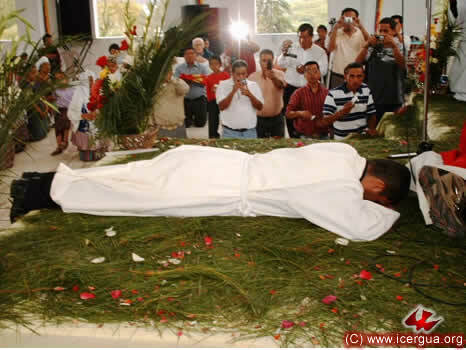 Left: José Armando is prostrate, a sign of his complete devotion and submission to God, while the choir sings the Litany of the Saints, imploring the outpouring of the Holy Spirit. 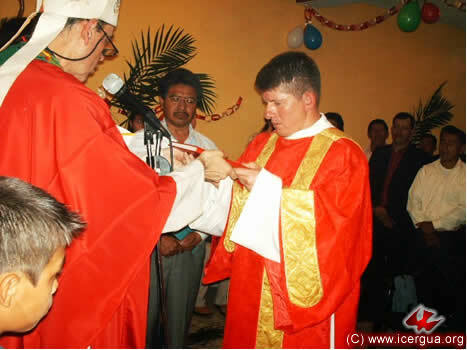 Left: The solemn moment of the laying on of hands, asking the Lord that through this rite and the outpouring of the Holy Spirit José Armando may be consecrated as a Deacon in service of the Church. 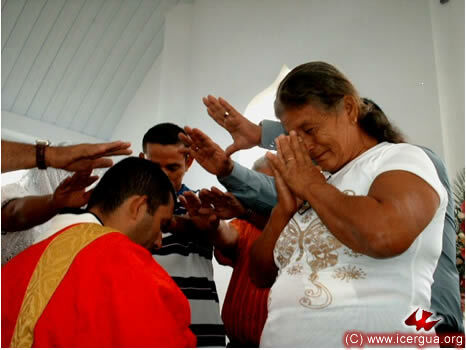 Right: An emotional moment in which José Armando’s mother and family pray over the new deacon, giving thanks to the Lord for the marvelous gift and imploring the grace of perseverance with faithfulness in the new mission. JULY 31. 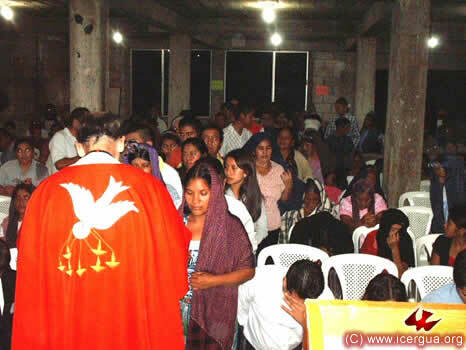 CONFIRMATIONS IN NUCÁ, SANTA CRUZ BARILLAS, HUEHUETENANGO. Al caer de la tarde, Monseñor Eduardo presidió la Eucaristía en la comunidad de Nucá, atendida por el Padre Marcos Caicedo, durante la cual se administró la confirmación a un numeroso grupo de jóvenes. 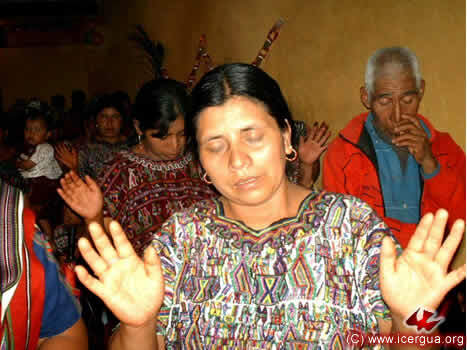 Ellos habían sido esmerádamente preparados y ahora, como apoóstoles de Cristo, asumieron el compromiso de intensificar su compromiso misionero. Above: Monsignor Eduardo addresses those being confirmed, inviting them to be aware of the what the sacrament of Confirmation implies and exhorting them to take on responsibly all the commitments pertaining to it. 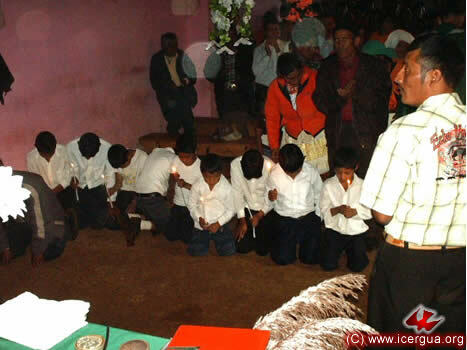 Right: After the confirmation, the young people are on their knees in front of their sponsors, who are imploring the Lord that they may persevere in grace and that the gift they have received may bear fruit.